Kamen Raidā Sūpā Wan: The Movie (1981) - Sci-fi-central.com. Japan  1981  . 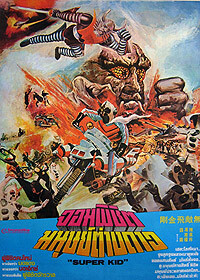  Starring: Hiroshi Miyauchi, Shunsuke Takasugi, Nobuo Tsukamoto, Akira Yamaguchi.  Music by: Shunsuke Kikuchi. The Dogma Kingdom attacks the Matagi (mountain tribe) village of Yamabiko to steal the sacred Flying Dragon Fortress and wreak havoc all over Japan. Six children from the fallen village take refuge in a nearby town, keeping their identities as Matagi citizens a secret. Kamen Rider Super-1 must protect these children from the Dogma Kingdom, as they hold the secret to the Flying Dragon Fortress' weakness.